Strawberries and Kiwi's are at times sour and its difficult to choose the only sweet ones when packed in a box. 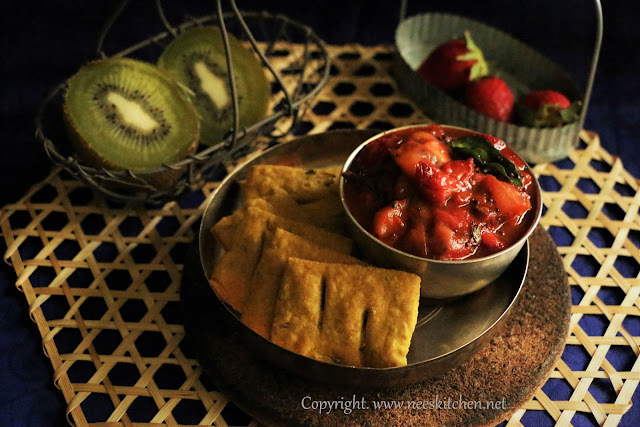 Here goes my recipe for the chutney version of sour strawberry and kiwi which cannot be eaten raw. This goes very well with idli and dosa's. Strawberry and Kiwi's both come in packed boxes hence it is quite difficult to check the taste of it. None of us at home like the tangy strawberry and kiwi. Hence I make them as a chutney so that it does not get wasted. The tangy and sweetness of kiwi & strawberry are very well balanced and hence this chutney goes well with idli's , dosa's and even tortilla's. 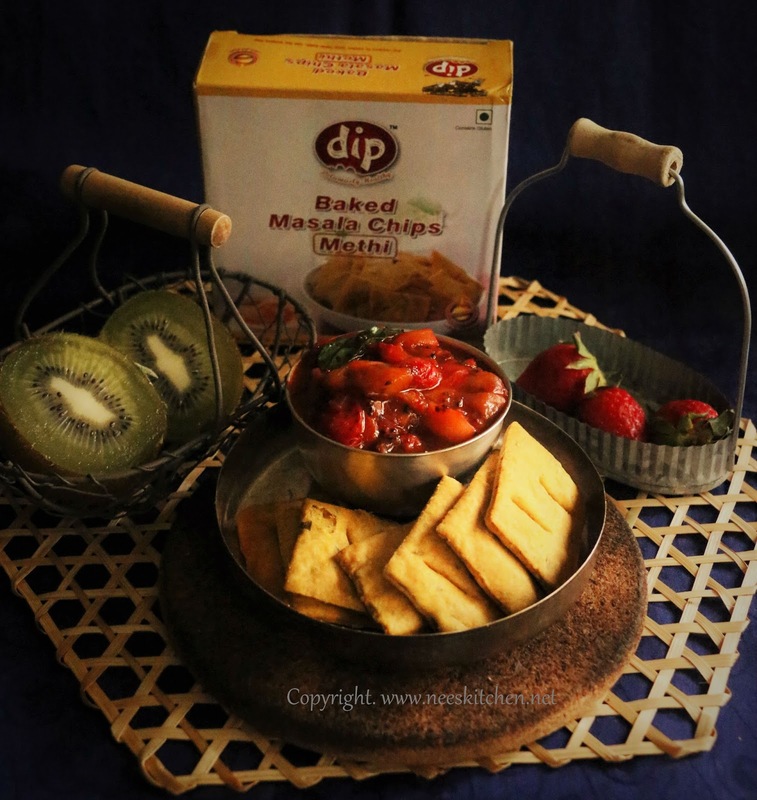 We had it with DIP Foods Baked Masala chips - Methi. 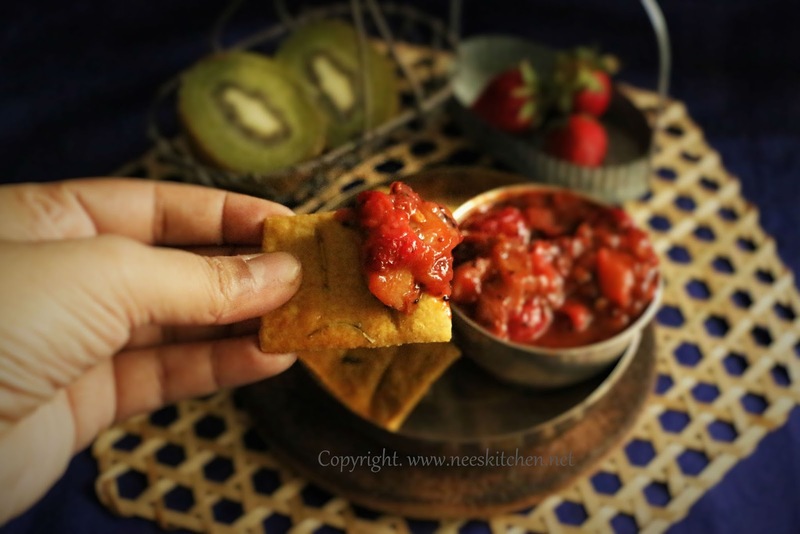 The sweet and tangy chutney went very well with the crispy & medium spicy masala chips. It is just ideal as a tea time snack. Coming to the product, the packaging was airtight and it was fresh even after I opened it after 2 months. I received the packet through courier and was a bit worried if these chips would break in transit. But the packaging was so perfect that none of the 8 products I received were damaged. The masala chips - methi was baked and hence I did not taste any oily. This product is ideal for any diet watchers, people with cholesterol and diabetes. Disclaimer: The product is sponsored by DIP Foods however the opinion and recipe are based on my personal experience. 1. In a pan put 2 spoons of oil and temper the ingredients given in "To Temper Table). Fry them until cooked. 2. Add garlic, ginger and saute for a min. Add Onions and saute them until they turn to golden color. Once cooked add strawberry and Kiwi cook for 5 mins. 3. Add salt,turmeric,sambar powder,coriander powder and mix it. 4. Add necessary water and mix well. Cook until the mix turns mushy. Chutney is ready. Serve it with Idly or Dosa. This can be made with Kiwi's alone. It tastes good when the fruits are sour. I used claypot to get a good flavor, we can use non-stick or any kadai.